A trip to Hawaii is incomplete without enjoying at least one Hawaiian hula performance. The hula dance is one of Hawaii’s oldest traditions and is often accompanied by either Hawaiian music (mele) or a traditional Hawaiian chant. While the Hawaiian hula dance has become a popular source of entertainment for visitors to Hawaii, its role in Hawaiian culture is to visually portray the story of the chant or song. 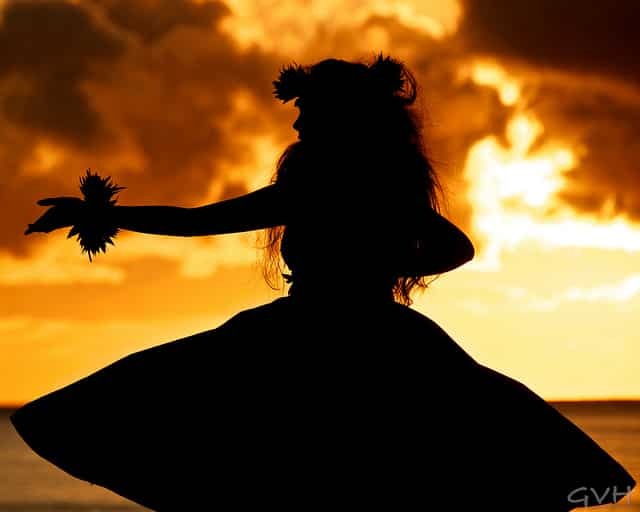 While you may already think you know about the Hawaiian hula dance, we wanted to share 10 facts that we hope will enlighten and educate you about this beautiful dance. 1. You’ll most likely see a hula performed at a Hawaiian luau. For the Hawaii visitor, you’ll most likely experience your first Hawaiian hula at one of the many great luaus found throughout Hawaii. 2. Most Hawaiian hula dances are performed by women. Female hula dancers usually wear colorful tops and skirts with lei adornments. 3. However, traditionally, men were just as likely to perform the hula. Hawaiian men still perform the hula and you’ll find them just as talented and focused. 4. Hawaiian hulas are often a religious performance. Hulas are not just a dance. The origin of the hula in Hawaii was that of a religious ceremony and today, a hula is often performed at blessings and celebrations. 5. You don’t just see the Hawaiian hula performed at luaus. In addition to blessings or celebrations, you are also likely to see the hula performed at a church service like we did at Hope Chapel in Kihei on an Easter Sunday. 6. Where there’s Hawaiian music, there’s likely a hula dancer. In fact, you don’t have to attend some large elaborately staged Hawaiian luau or event in order to see the hula performed. If you’re listening to a live Hawaiian music performance, then there’s a good chance a hula dancer will show up! It is a real treat to see these impromptu dances. 7. There are lots of free hula shows in Hawaii. And, most resort areas–especially shopping centers and malls–have regularly scheduled free hula performances. 8. Check your hotel for hula performances and workshops. Many hotels in Hawaii offer hula dance workshops or will have their own hula dance performances–often for free! 9. There’s a new generation learning the hula in Hawaii. Thanks to a resurgence, many hula schools (called Halaus) are teaching a new generation of hula dancers in Hawaii. 10. Not all dances performed in Hawaii are the Hawaiian hula. While you will likely see a Hawaiian hula dance at just about any luau you attend, not every dance is a Hula. For example, this is not a Hawaiian hula, but a traditional Tahitian Otea dance. We hope you enjoyed our brief look at the different aspects of the Hawaiian hula dance. We’ll finish with this video we shot of a hula dance performed for us as special guests at a home in Kauai. Please let us know your favorite hula shows, performances, or experiences in Hawaii. Interesting, I did not know this was a religious dance. Thanks for sharing! I believe that hula was originally practiced by men. There’s a lot of debate about that. Either way, both sexes make for stunning hula!